Frank Ferrel is one of New England’s most respected fiddlers, best known for his dance fiddling and many contributions to the traditional fiddler’s repertoire. Through a half-century-long career as performer, promoter, educator, journalist, video producer, researcher, and composer, he has accumulated an encyclopedic knowledge of all things fiddling. When I sat in on his classes at “Fiddle Hell,” a weekend of fiddle workshops held each November in Westford, Massachusetts, Frank was keen to share his recent research on Tommy Doucet. Doucet was an Acadian fiddler who had moved to Boston and become one of the leading figures in the 1930s club and dance hall scene. In an upcoming issue of Fiddler Magazine, we’ll share some of Frank’s discoveries about this lively period of New England’s musical history. But in this interview, we focus on Frank’s own multi-faceted musical life. A natural story-teller, it didn’t take much prompting to start him reminiscing, sharing old photos stored on his phone, and breaking out his fiddle to demonstrate bits of tunes to accompany his stories. Frank Ferrel: I grew up in Seattle. My grandfather had migrated from West Virginia, so he had a lot of the old Roy Acuff 78s and that kind of stuff. The kid across the street had a violin and was kind of a mouth and I didn’t like him, so I wanted one, too. I got the violin but my mom said, “Okay, but you’re going to have to have school lessons.” So I took school lessons and I learned to read and hold the violin correctly. My grandfather would be playing “The Wabash Cannonball” and I’d try to fiddle along with it. So it wasn’t like I was from a dyed-in-the-wool musical family. But they certainly had the roots. In 1972, I got a teaching fellowship for a year at Goddard College. So I’m up in northern Vermont with nothing to do and it’s winter and I walk into this music room and there’s a violin sitting there. And it needed strings and I thought, “Huh, I might mess around with this.” So I took it down to this little music shop in Montpelier and while I was waiting for him to put some strings on it, there was an LP of the Craftsbury Common Fiddlers Gathering. It was a compilation of all these fiddlers. And a book called Cole’s 1000 Fiddle Tunes. “Oh, maybe I’ll get that!” So I remembered how to read and I started sight-reading through this book. And then I saw they were having this big thing called the Craftsbury Common Fiddlers Gathering in northern Vermont. So I went up to that, just a total neophyte. I had to rethink everything I had ever come up with (on violin), except I knew how to hold it. Then I went back up to Goddard. And someone said, “Get your fiddle! We’re piling into a school van and going up to a Dudley dance.” I said, “What the hell’s a Dudley dance?” Well, he [caller Dudley Laufman] was doing a dance up at Franconia College. I’ve told Dudley this story many times and we laugh about it. I get there and he sees that I’ve got an instrument. He says, “Come on!” Anyone with an instrument got on stage and if you didn’t, you danced. I guess I looked a little bewildered. He reached into a bag and grabbed a copy of Cole’s 1000 Fiddle Tunes and shoved it at me, saying, “Billy the Barber Shaved his Father, page 93!” …So I followed Dudley around to Dudley dances all over…. And then I went back out West and finished school. But the mold had been cast. And I brought back all these records I had picked up from these different people. There were a couple of people who were really big in traditional music in the Northwest – Phil and Vivian Williams. They had Voyager Records. They had just discovered this old railroad engineer, Joe Pancerzewski, who played this northern style of music from the Midwest, Saskatchewan. And we hit it off. He took me under his wing and we started playing together and I learned a bunch of tunes from him. He had a very similar repertoire, because he was playing for Canadian square dances. It was that Canadian maritime [style], dance book collections, Don Messer and everything. And we were living in Seattle so we got cable TV and I could watch the Don Messer show every week. And John Allan Cameron and “Let’s Have a Ceilidh” with Winston Fitzgerald and all of that. My wife is from New England so we were going back and forth all the time to visit her family. Every time we’d hit Boston, I’d go find Gerry Robichaud. Then we met Tommy Doucet. I’d go to the French Club and there’d be all these Cape Bretoners come down. It was like a waterfall. And it made sense to me, for some reason. Then I met Paddy Cronin and a lot of the Irish players. The music sounded so familiar to me, but completely different from what I had learned from my grandfather – that sort of West Virginia mountain bluegrass. I loved the [bluegrass] tunes, but for some reason this just hit me and I couldn’t get enough of it. Do medleys go back a ways in this area or is that more recent? I heard an interesting comment this morning [at Fiddle Hell]. A fellow was doing a class on [Irish fiddler] Michael Coleman and his theory was that when they began recording 78s, they had three minutes. And rather than just play the same tune, which many of them did, over and over again, they’d create a medley. So Coleman sort of set that example, playing the big medleys. The “Tarbolton Reel,” “Longford Collector,” and the “Sailor’s Bonnet” – that’s like the holy trinity. You can’t play one of those, you gotta play all three. So medleys came out of the recording process rather than the dance hall. For the dancers, you didn’t really need to change the tune to make it interesting, like you would on a recording. Right, I think the recording and probably the advent of sessions had a lot to do with that. There is a tendency in Cape Breton music to play lots and lots of tunes. It’s a great pastime, a great thing to be involved in…. The music has taken me places that I would have never been if I hadn’t been playing – socially, geographically, economically. You just get a lot of interesting opportunities. Many are serendipitous, like finding these old players. Others are like when you get to play with a big-name group. And there are those times when I’ve played in a rest home and I start to play a waltz; I remember this older woman got out of her wheelchair and did about four nice waltz steps before the nurses came and helped her back into her seat. And at the end of my time there, the nurse came by and said, “I just have to tell you that Mrs. Smith hasn’t been out of that wheelchair for two years!” So your music has moved somebody. And that was as thrilling to me as playing on A Prairie Home Companion, or touring with the Boys of the Lough. That was a great moment, and I said, “OK, that’s the purpose of music!” That’s what the music is about…. It’s been a good ride! 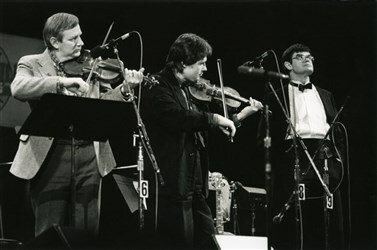 Photo: Frank Ferrel, Peter Ostroushko, Garrison Keillor on A Prairie Home Companion, c. 1985.